If your wedding ceremony is not round the corner from your house and in a different place from your reception you will need to think about how you would like to travel. As well as the bride and her party, the groom will also need transport. There are several options depending on distance. 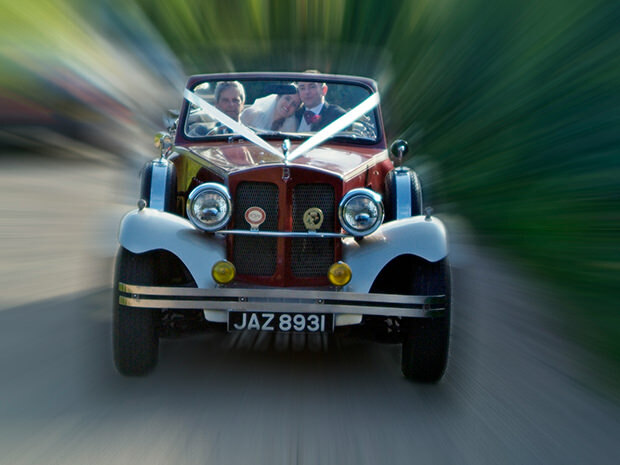 Classic cars are the most popular for the bride, and these can include limousines, VW moto-caravan, even tricycles or horse and carriages. Choose an established company that’s been in business for many years. The mother of the bride and bridesmaids will also need a suitable wedding car. They will leave about 10-15 minutes before the bride and her father leave for the church. If the distance is not too far there may be time for the same car to do both journeys. Don’t forget the groom. The groom, the best man, and the ushers need to be at the venue well before the guests arrive. It is his big day too so he deserves a little spoiling. A sporty car or an open top tourer will make his day. Having already visited the church and the venues, you must also make sure how the guests will arrive there. If there are no parking facilities nearby a bus is ideal. They can park their cars at the reception venue and be brought to the church on the bus.